Product categories of Flat Microwave Absorb Material, we are specialized manufacturers from China, Flat Microwave Absorb Material, Flat Microwave Absorb Foam Material suppliers/factory, wholesale high-quality products of Multi Layer Microwave Absorb Foam R & D and manufacturing, we have the perfect after-sales service and technical support. Look forward to your cooperation! JA-WW walkway absorber multi-layer semi-hardening lather plastic plate, possessing certain compressive strength. Its skin is wrapped up in cloth covers. 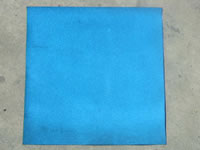 It is used for walkway material of anechoic chambers. It can also work as an absorption screen or a radar chamber to test EMC. 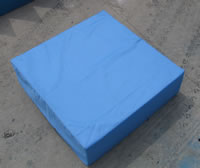 JAT flat laminate absorber: light blue thin-layer soft plastic sheet. It can be bent, mainly applied in aerial feed inner which is strict in thickness and weight. JAL flat laminate absorber: multi-layer soft plastic plate which can be bent, mainly used for the radar chamber aerial system inside . turret testing frame, etc. It can eliminate reflection interference. 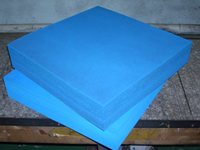 We could make the absorber as customer requirement ,please contact us for details.